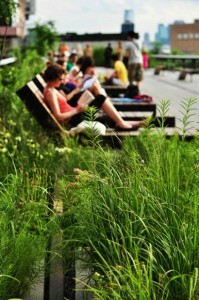 Members of the Diller – von Furstenberg family, including Barry Diller, Diane von Furstenberg, Alex von Furstenberg, and Tatiana von Furstenberg, have long been supporters of the High Line. Visiting from Los Angeles with his children a few weeks ago, Board member Alex von Furstenberg remarked how great it was to see people actually using the space, after so many years of planning. We thank The Diller – von Furstenberg Family Foundation for their generous support of this feature.